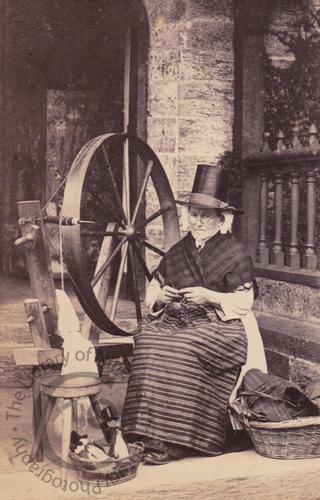 A carte-de-visite portrait of an elderly Welsh woman wearing the traditional costume of her region. An inscription on the back of the mount identifies the sitter as 'Ellen Pritchard / Age 74 years, 1890'. A popular subject amongst local photographers, she appears on the 1891 census as a widowed 'Lodge Keeper' living with her son and his family at Ffestiniog in Meirionnydd.